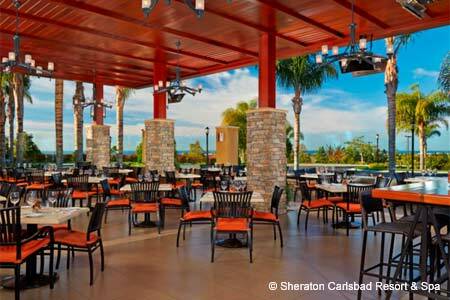 This casual wine bar/restaurant at the Sheraton Carlsbad Resort & Spa offers an eclectic menu. : Twenty/20’s eclectic California cuisine with a global spin marries French technique with locally sourced ingredients. Families, locals and business travelers alike will find plenty to choose from on the diverse menu. Starters include slightly piquant lamb meatballs nicely balanced with roasted baby tomatoes, cool mint and soft feta cheese, and Carlsbad Aqua Farm mussels with andouille sausage. We enjoyed the Korean barbecue ribs cleverly paired with watermelon, cucumbers and mint. The spinach salad with seasonal Carlsbad strawberries, pepitas, goat cheese and polenta croutons is another standout. Entrées run the gamut from hearth-baked pizzas and a good cheeseburger to five-spice barramundi, charred skirt steak jazzed with chimichurri and a deconstructed chicken and dumplings dish. There are 30 wines by the glass and hundreds of bottles to explore at reasonable prices. Look for tapas nights, "jazz on the half shell," barbecue cooking lessons and "Brewsdays" through the year.